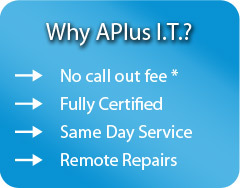 APLUS I.T are one of the Gold Coast’s most respected computer repair businesses with over 10 years experience. We take great pride in providing fast, quality service from fully trained and accredited computer technicians – and we back this up with our simple 100% guarantee. If we can’t fix it, you don’t pay! After all, you don’t want us to charge you if we provide no value. Our service professionals are available 10 hours a day, 5 days a week – with remote repairs being available 5 days per week! Often you simply cannot afford the time to have your computer out of action during the work day. We provide an after hours and weekend service by arrangement.